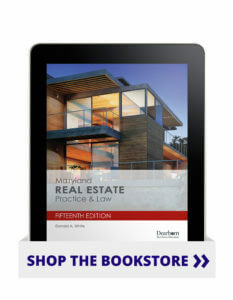 Long the premier text for Maryland prelicensing students, the 15th Edition of Maryland Real Estate Practice & Law provides a revamped text that incorporates recent legislative changes and helps students ace their exam. Each unit has been restructured with new learning objectives, an overview, and a key point review to improve retention of key information. Additionally, the text has been reorganized, and new unit quizzes, two practice tests, and a detailed answer key help students prepare for their exam.